It is really easy to go to Bangsaen because it is located near Chonburi city, approximately 10 kilometers. 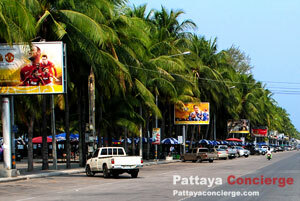 If you are in Pattaya you can take a 2nd class bus or a van to go to Nongmon Market, about 40 minutes – 1 hour. Then, take a red Baht Bus (Songthaew) to go to Bangsaen beach . - 10 Baht for red Baht bus. For those who come from Bangkok, they can take a bus at Ekkamai or Mochit 2 (both are main bus terminals in Bangkok). The buses that will pass Nongmon Market (the market near the beach) are Bangkok-Rayong, Bangkok-Pattaya, and Bangkok Sriracha, though visitors need to inform the ticket seller and the staff on the bus about where to get off the bus. When arrive in Nongmon Market, take the flyover to the other side for taking a red Baht bus to the Beach. Note, some of red Baht Buses here might go to Chonburi city as well, so visitors need to ask whether the Bahtbus are going to the Beach or the city. In the case that visitors have their own vehicles, to go to Bangsaen is really simple. - From Pattaya, just drive the car along Sukhumvit Road to Nongmon Market. Then turn left and go straight on a little to Bangsaen Beach. - From Bangkok, drive to Chonburi then use the bypass to avoid traffic in the city. After that, visitors have two choices to go to Bangsaen Beach. First, turn right (just after Big C Extra hypermarket) to Angsila, but don’t have to stop over at Angsila. Go straing on along the main street, the beach will be in 15 minutes. The other way is to go to Bangsaen and turn right just before arriving in Nongmon Market (there are notice boards for the beach also). Remember that In Bangsaen, normally visitors have a private can can drive as they please, but on the weekend, where a lot of visitors come to visit Bangsaen, some roads change to one-way road to avoid traffic jam. To get around Bangsaen Beach, the main transport service for visitors is red Baht Bus because it is the transport for transferring between Bangsaen-Nongmon Market-Chonburi City. Almost visitors that have no vehicle need to use this type of transport to get around Bangsaen (mostly for Bangsaen-Nongmon and Bangsaen-Laemtan). The price for this baht bus is in general 10 Baht per person. However, it does not go to Sammuk hill if visitors need to visit this hill, they might need to hire a baht bus as a private trip. 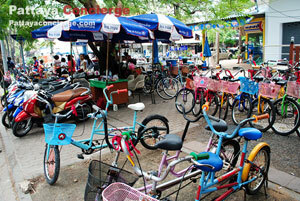 For getting around Bangsaen, there are also some other options for visitors. These options are bicycle rental and motorcycle rental,where the shops for rents are just at the beach front. In this case visitors need to pay for rent in advance and deposit the ID card (Passport) with the shop owner. The price for rent is standardized by the mayor of Saensuk city. For normal bicycle (for 1 person) 50 Baht per hour. For tandem bicycle (for 2 persons) 60 Baht per hour. 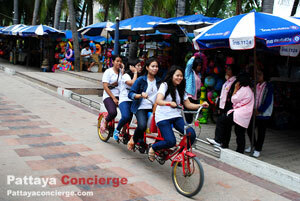 For tandem bicycle (for 3 persons) 70 Baht per hour. For tandem bicycle (for 4 persons) 80 Baht per hour. *In the case visitors prefer to rent the normal bicycle for a day, the price becomes a little different for each renting shop (about 150-200 per day, though it is not expensive anyway). However, for the tandem bicycle, some shop does not allow visitors to rent over night. For renting a motorcycle, visitors need to ask the shop for the renting price for each shop because it might be a little different and the condition for rent can also be different. Though, normal renting price is 200 baht per hour with a full tank of petrol. ** Additional information, in general the price for take a shower and toilet are 10 Baht and 5 Baht respectively.